The global specialty silica market shows a consolidated market as it is confined with limited number of players. The dominant players hold 50% of the market value, as analyzed by Transparency Market Research (TMR). Some of the key players dominating the specialty silica market are Huber Engineered Materials, Cabot Corporation, Evonik Industries AG, Akzo Nobel N.V., Wacker Chemie AG, Tokuyama Corporation, PPG Industries, Inc., Solvay S.A., and W. R. Grace & Co. The report throws light on the growth indicators for the forecast period between 2016 to 2024. During this tenure, the market is expected to reach a valuation of US$ 7.32 bn which was US$ 4.62 bn in 2016. The CAGR of this period is estimated to grow at a steady 5.9%. The rubber segment under the application category where footwear, tires, and industrial tools are being widely used is projected to dominate the market during the forecast period. Regionally, the market in Asia Pacific is expected to boost the specialty silica in coming years. This region holds up to 45% of the total market value. North America is also expected to hold significant shares during the forecast period. The increasing use of specialty silica in green tires and high global demand in automotive industry have grown the market significantly. Rising demand for automotive in emerging market especially in Asia Pacific region. Higher demand for cleaner and swifter vehicles in the automotive industry has significantly boosted the specialty silica market across the globe. Increasing awareness among the huge population to reduce carbon emission has also driven the demand for green tires that will further increase the demand for specialty silica market. Moreover, growing demand for fumed silica due to developments in chemical mechanical planarization (CMP) will also help to expand the global specialty silica market during the forecast period. Increasing applicability of specialty silica in the numerous industry, the specialty silica market is expected to flourish in coming years. Growing number of automotive, construction and industrial sector in the emerging economies is further expected to boost the market. Asia Pacific is leading the market with 45% of share. Countries in Asia Pacific include Japan, China, South Korea, and India. 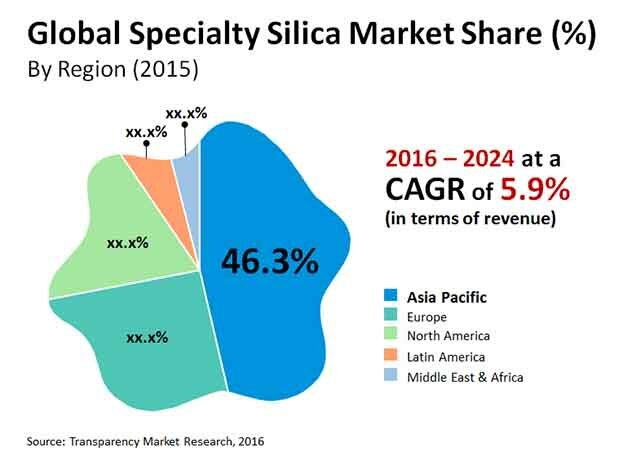 Moreover, Asia Pacific and North America both are projected to expand the market for the specialty silica players that will increase the revenue generation for the specialty silica market. Additionally, growth in consumption with increasing developments in consumer electronics industry will create huge opportunities for the manufactures in specialty silica market. Although sluggish growth of paints and coating industry may hinder the market to attain its full potential. However, these restrains can be overcome with consistent efforts made by manufactures across the globe.